Listen to the music. Hear the elements. Connect your playlist. Listen to This is designed to connect students’ interest in the music on their own playlists with great music from throughout history and all over the world. It is based on the idea that all music is built on a combination of a few basic elements — melody, dynamics, rhythm, harmony, texture, timbre, form, and word-music relationships — and if students listen for those elements they can better understand how a piece of music works, no matter how unfamiliar it may seem at first. This elements-centered approach provides a strong foundation for learning about, and enjoying, many new musical styles. The Fourth Edition includes expanded coverage of timbre as well as new chapters on additional musical works. 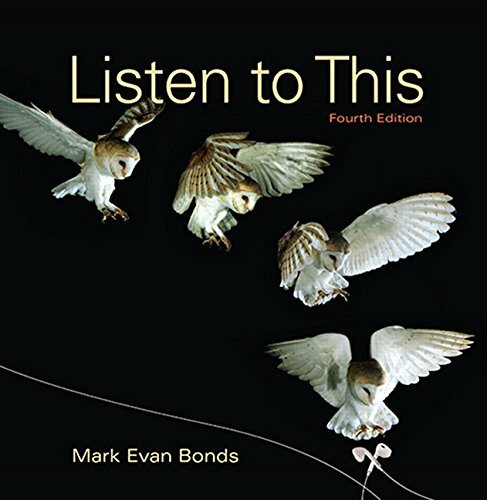 Listen to This, Fourth Edition is also available via Revel ™, an interactive digital learning environment that replaces the print textbook, enabling students to read, practice, and study in one continuous experience. Revel is ideal for courses where student engagement and mobile access are important. Available to package with Listen to This, Fourth Edition, MyLab™ Music for the Music Appreciation course is an online homework, tutorial, and assessment program designed to work with this text to engage students and improve results. MyLab Music also gives students access to the music and listening guides that accompany the text. Please note: this version of MyLab Music does not include an eText.